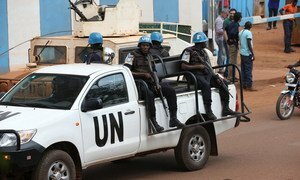 MINUSCA, the UN Multidimensional Integrated Stabilization Mission in the Central African Republic (CAR), on patrol in the capital Bangui. The Mission said that on Thursday, suspected armed anti-Balaka fighters attacked MINUSCA personnel who were securing a logistics truck near the village of Pavika, located 22 km from Alindao, in CAR’s Basse-Kotto Prefecture, which is in the southern-central part of the country. Peacekeepers from the advanced MINUSCA Force military post at Pavika were en route to reinforce the convoy that evening when they were ambushed by another suspected armed anti-Balaka group. The blue helmet was killed in the ensuing shootout between peacekeepers and the attackers, who later fled the area. The Mission also extended its condolences to the family of the victim and to the Government and people of Burundi.